I can’t believe I have already breezed through the second week of this No-Spend Challenge and things have been going so well. I am really recognizing my spending impulses and a lot of it seems to have to do with the power of suggestion (helloooo, Instagram) and when I have pockets of free time that have me heading over to my computer to do a little online shopping. 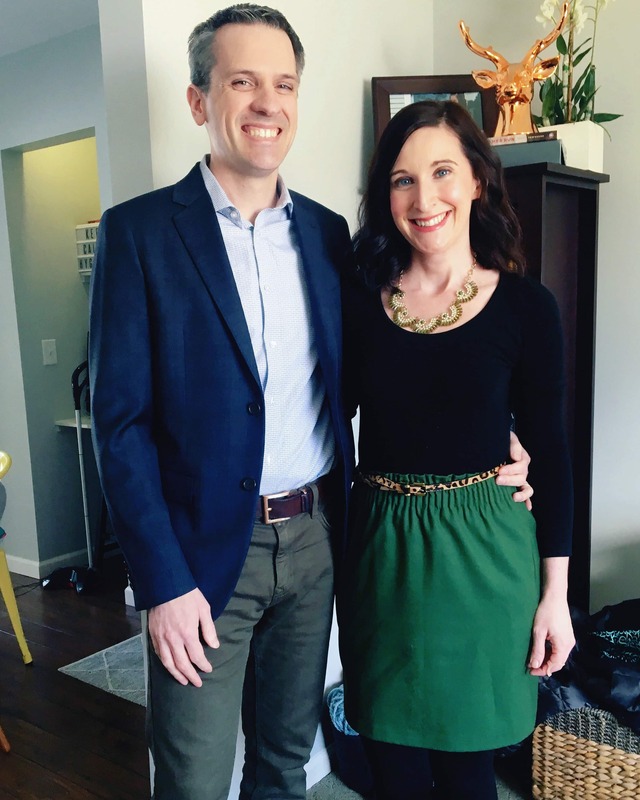 It was my husband’s birthday week and I had disclosed at the beginning of the challenge that I wouldn’t be skipping his celebration dinner just because I wanted to save a little money. We went to his favorite fancy spot and had a wonderful meal that we savored together. I never take for granted what a good life it is when you get to spend your life with your best friend. When I began really getting the hang of cooking, we have found that we really don’t enjoy dining out anymore, unless it is somewhere really spectacular. I wouldn’t say our dining out budget has been cut down necessarily, but that we now would rather pay for one really incredible meal rather than four disappointing inexpensive meals. It was a fabulous night and there was no need to buy anything special to wear thanks to that well-equipped capsule wardrobe. I have a MoviePass, but I always am trying to coordinate with other people to go and see a movie. 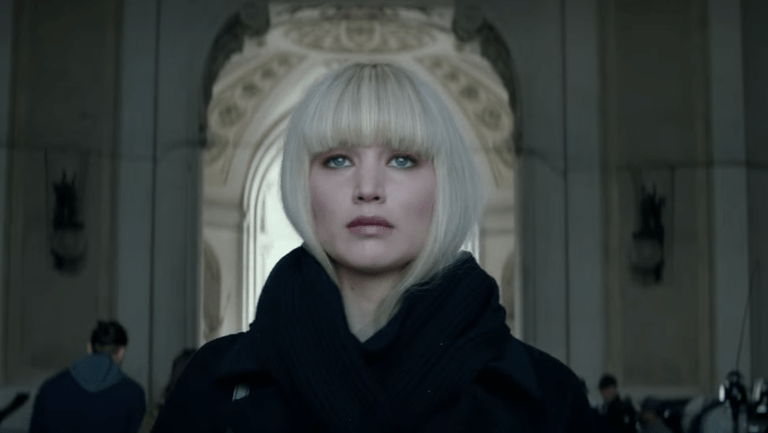 I have never gone to the movies by myself, but I was dying to see Red Sparrow (my husband was not) so I decided to have an impromptu movie date by myself. My INFJ heart was very happy AND I absolutely loved the film. I packed a snack in my car to enjoy on the way home and avoided the concessions stand to hold to my challenge. Boy, that popcorn smell almost had me caving! Dining at home is never a biggie, but I have gotten in a bad habit of just buying groceries impulsively and not really looking in our pantry and freezer. 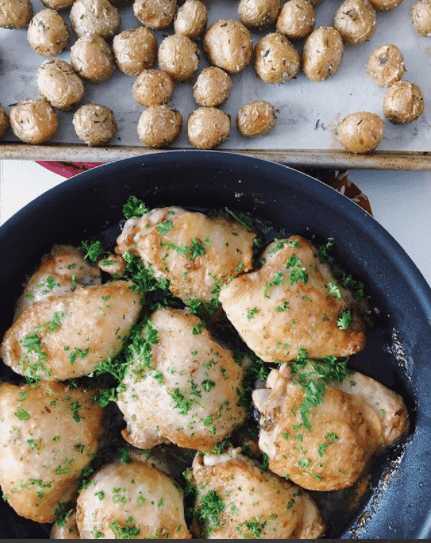 These chicken breasts became this delicious dish and a forgotten bag of potatoes made the perfect side dish. We enjoyed this with some belly-laughs over this new Netflix series. 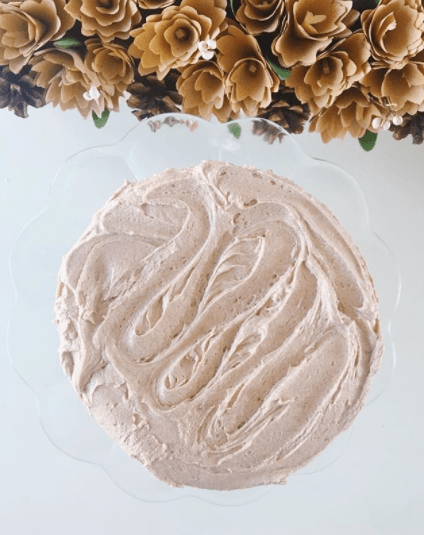 It made me thankful to see other people #nailingit like me when it comes to baking. Do you follow bloggers because you love seeing all the new things they have gotten? I know that there are certain accounts that I follow because it seems like they always have the latest thing. I realized this week that creatively, it is MUCH more challenging to inspire people WITHOUT buying things. I have to think a little harder about what I have been putting out in the world and how to inspire people without spending money. I have always been committed to good living on a small budget, but am I always sharing in these ways? 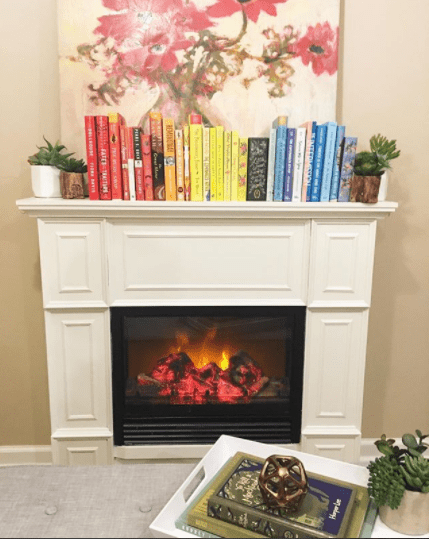 I needed a little Spring for our mantle, for example, and shopped the house to create a cute little rainbow of books for the mantle. My hubby declared this the MOST Pinterest-y thing I have ever done and I am not ashamed. We have so much here- why do I feel I need to buy things to inspire other people? This week I have been more busy than usual and haven’t been sitting at my computer and instead found myself with three wonderful dates (at my house- #nospendchallenge, you know!) with three amazing women that inspire me so much. 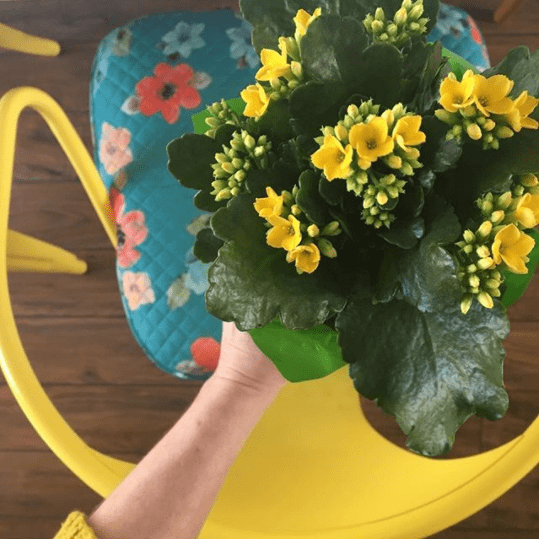 I love entertaining, but sometimes it feels more convenient to just go out rather than clean up our messes (or, heck, let people witness our messes) and open our home up…warts and all. 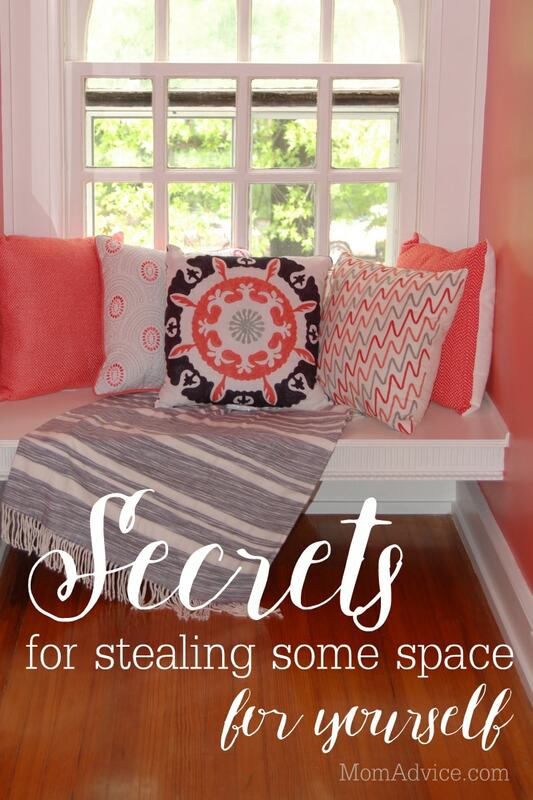 We remodeled our home with the intention of sharing our home with others and we should be doing just that. What a blessing to have the space to do it in and to share it with others. One friend brought me this book (I can’t wait to dig in), another brought me this beautiful plant, and another brought all the appetizers and wine for a fun night in my little shed. Hostess gifts were savored so much more this month! 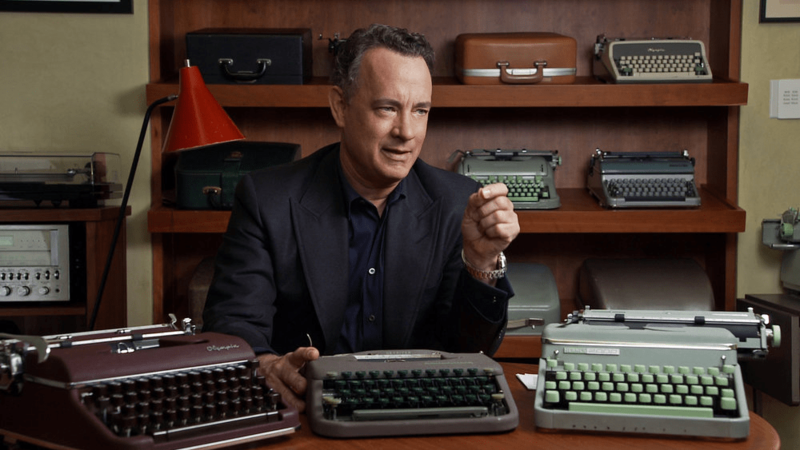 We ended the week with a pajama-date today and watched this phenomenal documentary on typewriters (available on Hulu). If you have a free afternoon this weekend, it is such a good one. I will admit, it had me feeling a little melancholy about my love/hate relationship with technology. I love sharing here, but I struggle with too much technology in my life. I am sure I will have lots to learn when I detach from social media a bit next month! Next week I am traveling for business so I will have some expenditures with business travel, but I’m hoping to continue the mindful approach to spending, just as I have been doing these past two weeks. I got a few messages wondering how I am doing over here. You guys never cease to amaze me in how intuitive you are when I’m going through a rough patch. It’s been such a frustrating process of working really hard to feel better, but hitting depressing hurdles that send me back to square one. Honestly, my body hasn’t been cooperating with my 2018 plans. Last night, in the wee hours of the morning, I started thinking about what drives me and how to get control of that drive in my life. Typically, this reflection happens in January, but if I waited until next year than I would be missing out on improving my life in the next upcoming months. I started jotting down things that I struggle with and what I’d love to see myself do better at. 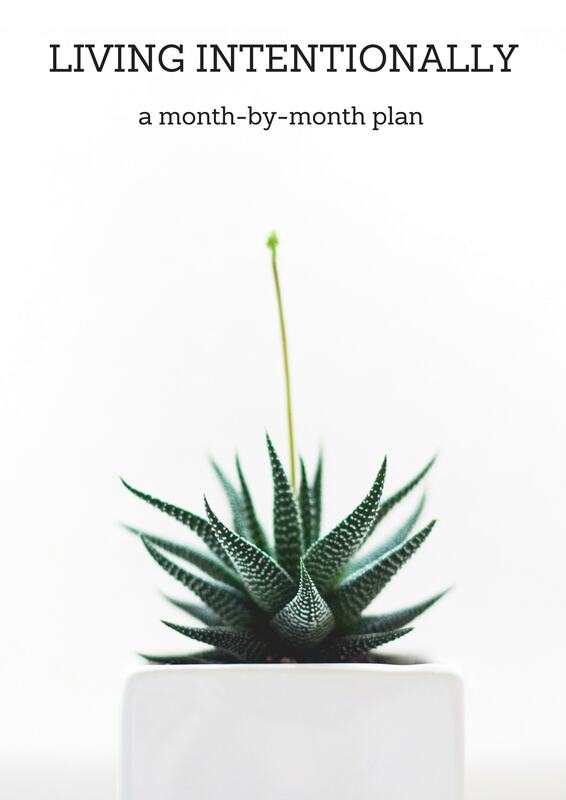 I love seeing long lists of monthly intentions from others, but I’m going to be really proud to put one intention out in the world each month and accomplish it. Setting intentions helps give my days more purpose and I love seeing what good things can come from intentional living. Blogging has a way of holding me accountable and I thought I could journal what I learn each month as I’m working my way through these intentions. If they are things you struggle with too, maybe you might want to join me? 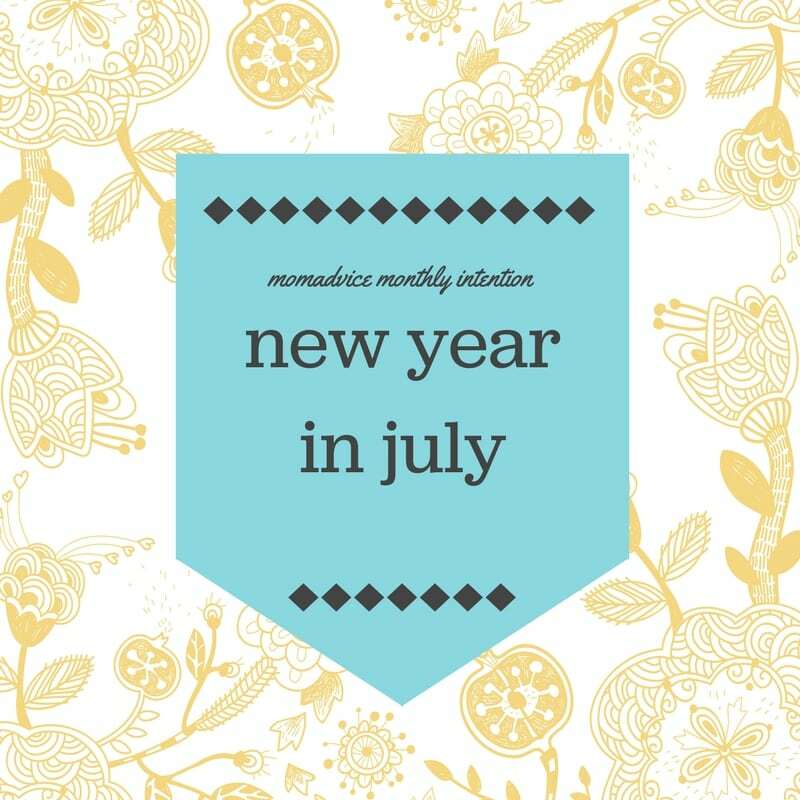 Here are the monthly intentions that I want to work through this year and why. 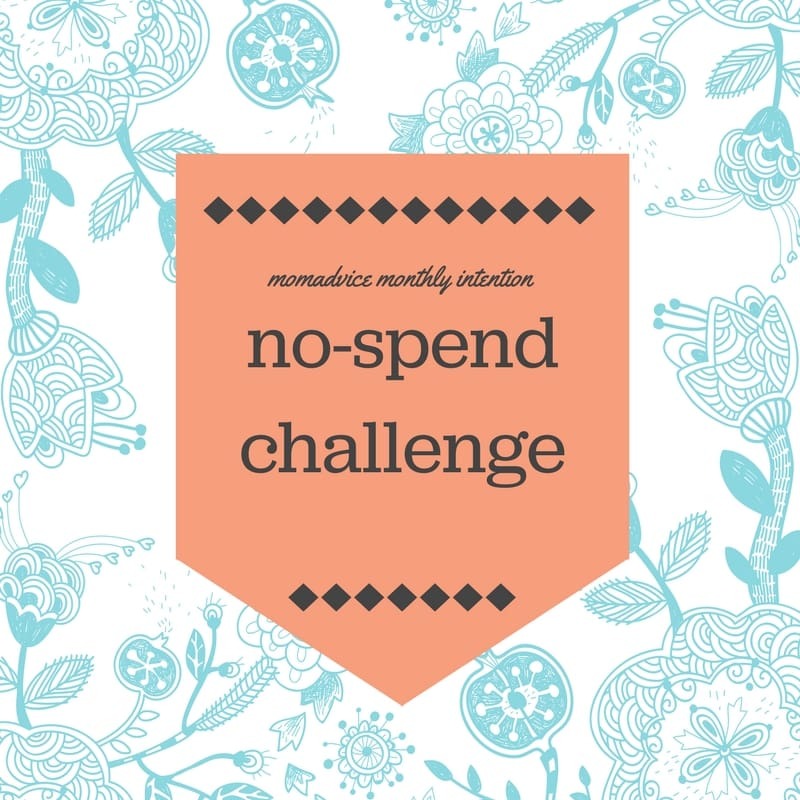 It’s been awhile since my last no-spend challenge and March is the perfect month for it. I’d love to spend some time evaluating my spending habits, resist the urge to buy a bunch of stuff for our Spring Break trip, and to get our tax paperwork in order. I feel like we have been hemorrhaging money and I’m hoping this challenge will remind me how to do better with our family finances. April is THE WORST for me because I start the comparison game with the Spring Break trips and often get so consumed with that, I fail to enjoy our own break. While I can’t completely detach from social media, there is no reason to spend my days endlessly scrolling. I’m going to try to reel this one in, especially since this tends to be an unhealthy habit for me in April. I’d also love to go social media free for the first week of April to get the most out of our family trip. I can use my illness as an excuse all I want, but I can still be moving in some way, even if I’m not doing a full-out workout. 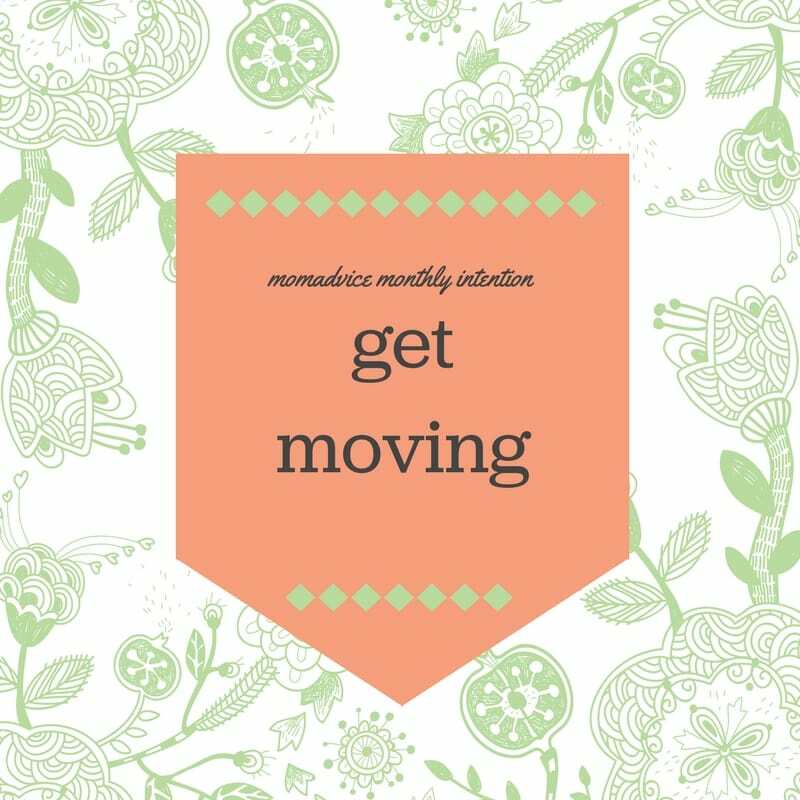 May is when I tend to start the summer slack so I thought this would be a perfect time to remind myself to get moving. Ideally, 3-5 days a week, I’m going to be intentionally moving…even if it is just a walk around the block. Despite all appearances, there is a lot of clutter in our house and I’d love to reign it in. Closets, pantry, dumping spots (for us it is the laundry room & garage) all could use some organizing. 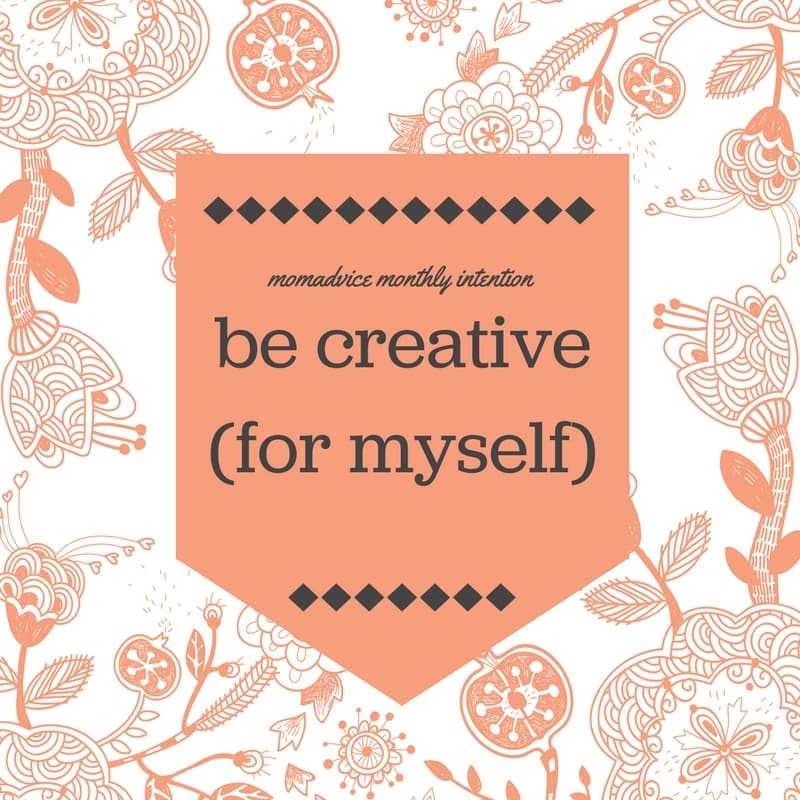 I also am queen of abandoned projects so I’d love to get a few of those done during this month of organization. 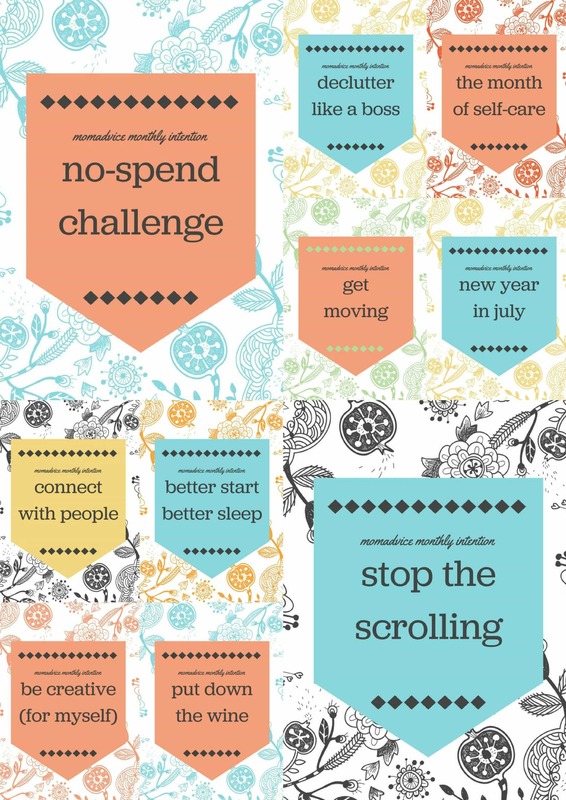 I love to make New Year’s resolutions…and then abandon them. This month will be the perfect time to revisit what I put out in the world and try to actually check a resolution (or two) off my list. I would love to get back to being creative and I have plenty of tools to do it. There are a few items on my crafting bucket list and I’d love to set the intention to actually do something creative for myself each week. I love sharing drinks with friends and with my husband over the summer, but it quickly becomes a nightly habit after enjoying it so often in the warmer months. I’d love to do a dry month and see what I can learn from a month without my wine. I know how much better I feel with good sleep and a great morning routine. I’d love to focus on that by getting my sleeping habits back on track. I have the tendency to sabotage myself by hopping on my phone at night or staying up too late with a good book. I’d like to see if I can feel better by being intentional with better sleep habits. I’m an INFJ and I have the tendency to REALLY introvert when the months get colder and my body isn’t feeling as good. I’d love to set the intention that I will work harder to connect with people in my life during this challenging time. The holidays run me down (as I am sure they do you too!) and I would love to be more intentional about self-care during this challenging season. It won’t be extravagant luxuries like spa days, but setting intentions AT HOME to take care of myself. I’m really excited to share with you what I learn from these challenges, starting with a discussion tomorrow about my No-Spend March. I think it is the perfect month to reset before our spring vacation, don’t you? I’m hoping with a goal each month that I can start feeling like the old me again! My daughter has always been annoyingly observant. This means, first of all, that you cannot have “for grown-up ears only” conversations around her, make promises (or threats) you don’t intend to keep, or expect her to simply forget about the slightly traumatizing or embarrassing event from last week. (I know. Typical, right?) But it also means that as a two-year-old, she recognized the insanity of the suburban grocery store situation. She was just two years old, but already she was realizing that in this suburban setting, we can find a grocery store on just about every corner. Of course, as she was also learning, not all grocery stores are created equal. For example, the big box store where we usually buy groceries is a smaller version of the big box store a few more miles down the road. When it was first converted to a superstore with groceries, I was super excited. Driving fewer miles to buy groceries was a definite plus, but I was also relieved to shop in a store slightly smaller than the Atlanta airport. Until I couldn’t find the right peanut butter. Or deodorant. Or soy milk. Talk about first-world problems! And…talk about setting a bad example! We live in a small house in an old, deteriorating neighborhood. Nearly every room in our home is broken in some way, and my car drives like it’s one gear shift away from a failed transmission. Every holiday, date night, birthday party and new outfit stresses out my budget and me. And we carry a much higher balance on our credit card than I like to admit. However, by the standards of a huge majority of people in this world, we are wealthy. Not just comfortable, but rich. How, then, do I teach my daughters a healthy perspective on all our blessings, as well as a grateful and giving heart? We can make meals and deliver them. We can order pizza or pick up chicken and deliver it. We can send a thank you note. We can send a gift card or a gas card. We can proofread her resume – and explain LinkedIn. We can take baby clothes to a friend. We can pick up a Sonic slush on the way. We can keep extra gloves and granola bars in the car for those in need. We can sit and visit and listen and laugh (and maybe cry, too). We can pack up the kitchen and the boxes and the truck. We can unpack the truck and the boxes and the kitchen. We can order another pizza or fill up her freezer. Helping friends in a real, tangible way is important to me. And just as important is teaching my girls that this is what we do. We don’t just talk about it or feel bad about it; we don’t just toss out platitudes or empty promises. When we hear about a lost job, a scary diagnosis, another round of the flu, a last-minute move, a no-good, very bad, terrible day, we can do something. We can help. We can give out of our abundance; we can love. 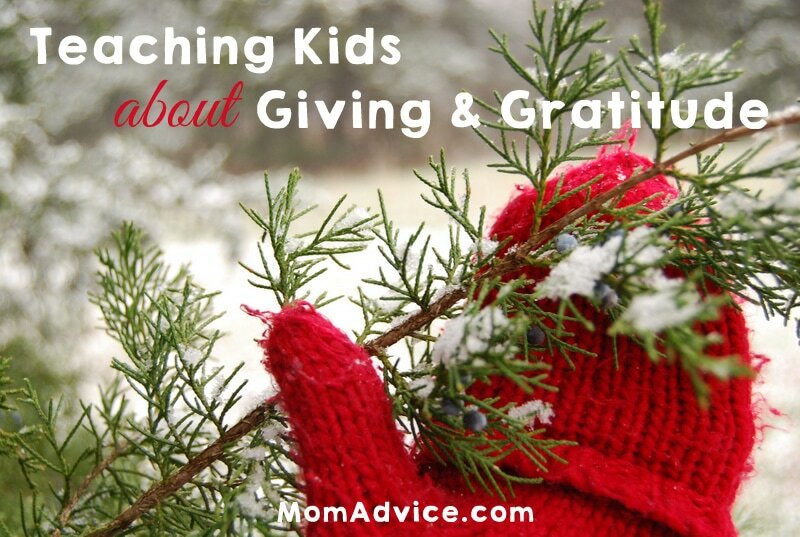 How do you teach your kids about giving and gratitude? I set my alarm for 6:30 this morning. But when I realized I was putting away my book at 1:30, I decided I’d better turn it off. Luckily (and not commonly) my girls slept past 8:00 – which meant I didn’t get the early start on my day I’d hoped for and needed. I didn’t get that email sent or the laundry changed or – I’m the saddest about this one – the shower taken. No, instead it was another morning full of chaos and rushing around, shouting at one daughter to brush her teeth and make up her bed now, now, now then frantically rustling through the fridge and pantry to find something to pack in the other one’s lunch. I got my contacts in but no makeup on and just enough deodorant to [hopefully] prolong anyone noticing my lack of shower. And the house? Well, it was a victim of one more hectic and hurried morning, with papers covering the table and dishes filling the sink. Don’t even ask me about the laundry. I’m not a morning person, you guys. Like, AT ALL. When I was a little girl, my dad worked the evening shift so I stayed up very late with my mom. You know, watching M*A*S*H and Barney Miller and Taxi, like most three-year-olds? It made sense for my family and I only blame my parents for my night owl ways in jest. Really, it’s just how I’m wired and what I prefer. Nights are my favorites; mornings are the worst. But I can’t argue with science. And evidence. And facts or whatever. [Yes. This is how immature and disgruntled I am when discussing the benefits of early mornings. I’m not even going to try hiding it!] Studies have shown (and early birds have bragged) that people who get up early are more successful. Studies have probably shown that they’re happier and thinner and more organized and always send their Christmas cards on time, too. I’m not sure about that part; it just seems like something morning people would say. Sigh. I can joke all I want, but the truth remains that mornings are made for productivity and sanity and a life that runs smoother than what I experienced this morning (and so many others). And it’s with these frustrating facts in mind that despite my night owl ways, I am constantly trying to get up earlier. I’ve told you all this because I don’t want to make it seem like I have it all together, like I’m some sort of morning expert (ha! ), like my mornings actually couldn’t GET any better. That is the opposite of the truth. 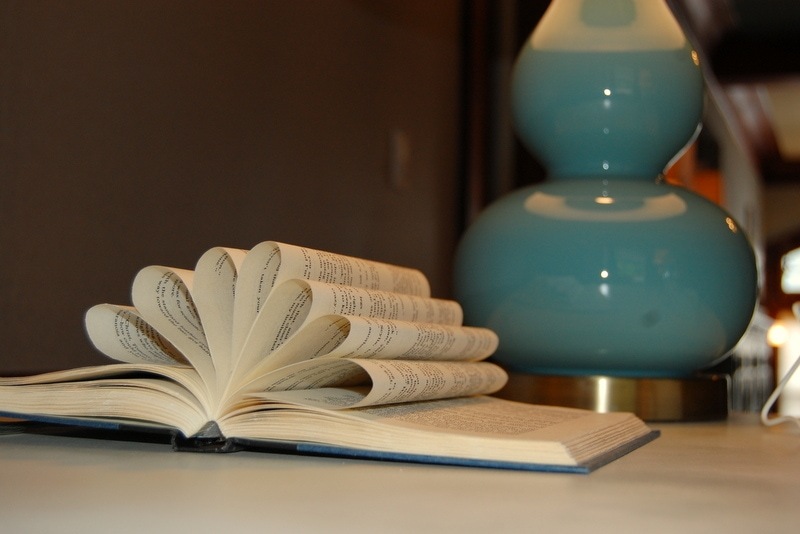 So if you are longing for better mornings in your life and your house, you’re not alone. I’m with you, and here are some things I’ve tried in the past and plan to try in the near future. Stop reading mid-chapter. 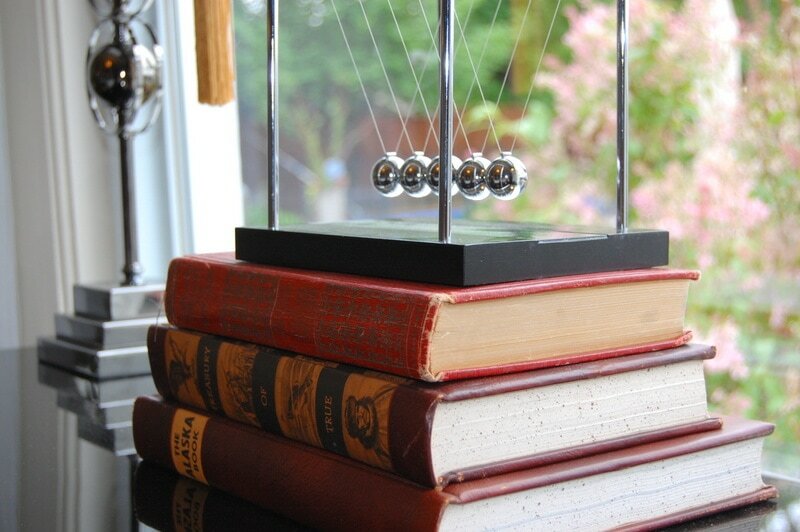 If you are a late-night reader like me, this tip from Modern Mrs. Darcy is crucial. Don’t fall prey to the wily ways of authors. They make those chapter endings cliffhangers on purpose, friends! They want you to stay up all night reading! They do not want you to be presentable or coherent in the morning. So foil them and your night owl-ness by stopping in the middle of a chapter. Wind down with mundane tasks (fold laundry, empty the dishwasher, balance your checkbook). I seem to get a second wind right before bedtime, when I realize the clock isn’t kidding about how late it’s gotten. Which might be great for getting a few more things accomplished before falling into bed…but isn’t so great for turning off my brain and falling asleep. So I save the harder tasks that require more brainpower for earlier in the day. Keep a notebook by bed. In case your brain still won’t turn off. Or in case your best ideas show up at the worst times. Sure, sure, get up earlier. 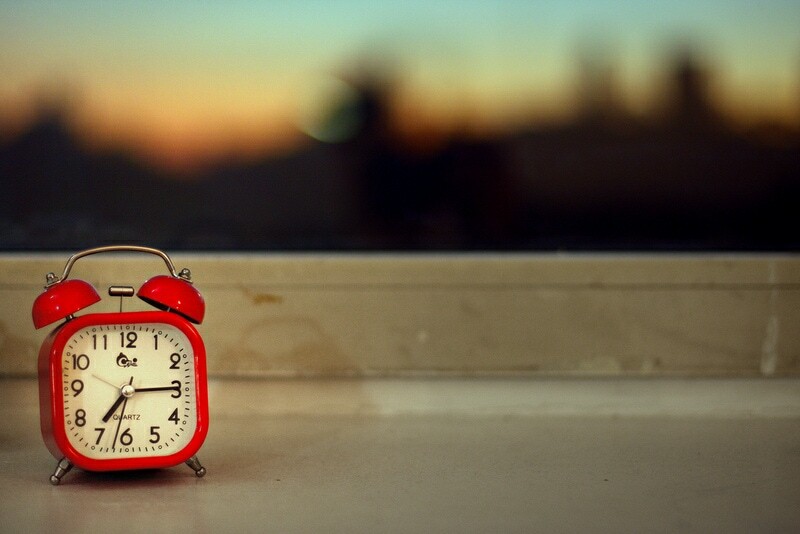 Maybe try baby steps and set your alarm just a few minutes earlier each day. But in case getting up earlier is as hard for you as it is for me, here are a few ideas for milking the minutes before the day starts, few as they may be. Work in advance. Make lunches, choose outfits, pack bags and find paperwork before you even go to bed. Fix breakfast before you need it. Take an hour or so each week to make a batch of breakfast muffins or casserole – or smoothies (my most recent obsession). Give a hug. More than one of my friends swears by The Hugging Method. Okay, fine, I don’t know if it’s actually called that, but they start their kids’ days with a 10-second hug. For their families, it makes a world of difference in how they all approach the start of a new day. One of these days my grumpy morning self is going to give this a try. Get a drink. I’m one of those weirdos who doesn’t love coffee. (I know. I KNOW this might be why I am so bad at mornings. I know!) But I do know that drinking a big glass of cold water goes a long way toward waking me up and shaking off the groggy haze of I Stayed Up Too Late Again. 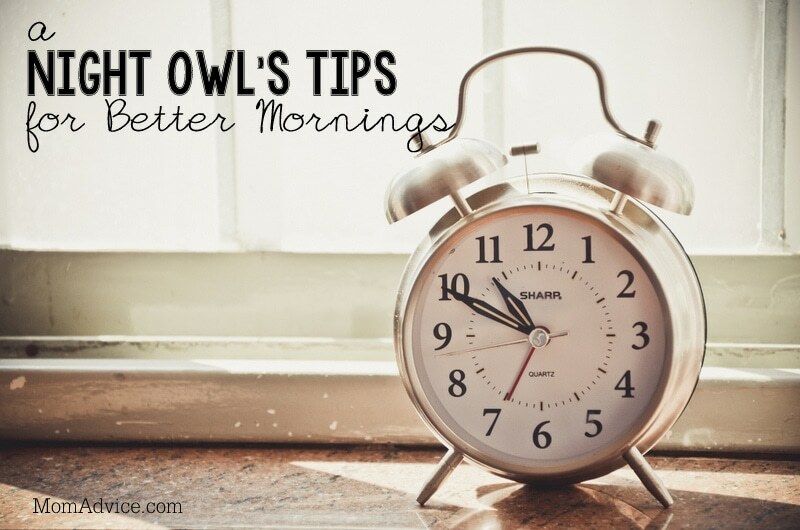 So, tell me: am I alone in being a night owl who struggles with mornings? 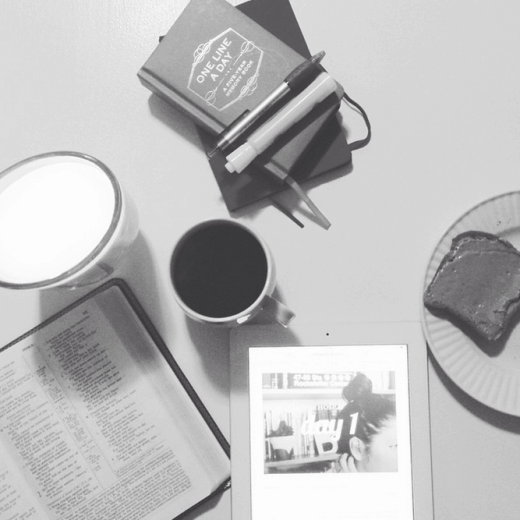 How do YOU create better mornings? Photos by Henrique Simplicio and Alex via Flickr’s Creative Commons. I was forced into being a morning person thanks to my kids. In my younger days, I would stay up late watching mindless television, and would sleep in until the last possible moment. There is nothing like an early bus schedule to take a girl out of her cushy routines, is there? Although I never desired to be a morning person, it’s incredible how much better I feel and how productive I can be with those extra morning hours. I am actually pretty thankful that early mornings are now a part of my routine and I even try to maintain the schedule as best as I can during the summer months. If I can become a morning person, ANYONE can! 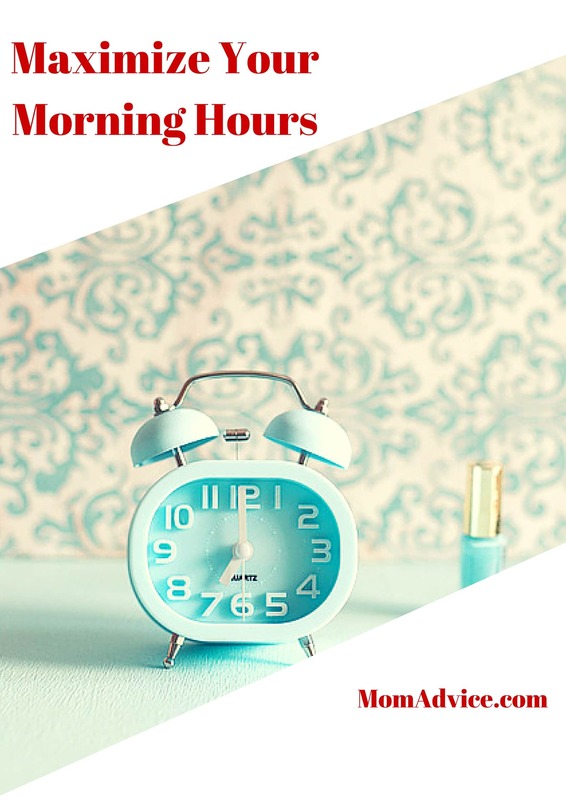 Today I wanted to share a few tricks that have helped me in creating an ideal morning for my family and I’d love to chat with you about your ideas too! Getting up earlier can mean that I am a little less productive in the evening since I am usually pretty worn down after a full day! I try to make a couple of things top priority though to help save my sanity in the morning. The first is that I always set my coffeemaker the night before and program it for my morning brew (this is the inexpensive pot that I use now), I always make sure that the dishes are done and that the dishwasher is run, I always try to get all the paperwork signed and in the backpacks, and I always try to lay out my gym clothes the night before so I can hit the gym first thing in the morning! These small habits in the evening help us start on good footing the next morning. I have a hard time staying on track with the multiple schedules going on during our mornings. Maybe that is just me? I set an alarm on my phone to make sure each kid is up and then I set an alarm 5-10 minutes before we have to head out the door to have them get their shoes on and grab their gear. Although it doesn’t apply to my morning routines, I set alarms to remind myself when I need to head out the door to the gym, when the buses are returning, and even an alarm to remind me that I can take a break for the day from work and read for an hour. My poor cat is so annoyed by my alarm system that she cries every single time one goes off. I sometimes want to cry too. I love the reminder though to keep things on track so we don’t miss our morning buses or oversleep! 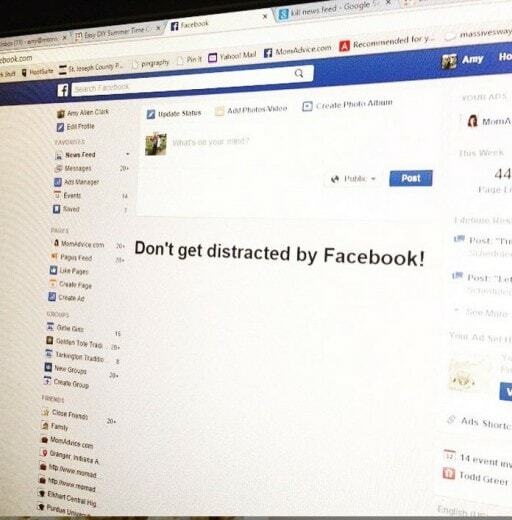 I know everyone struggles with getting distracted and the quickest way for my morning to get off track is to turn on my phone or computer. I decided to add the Facebook Kills News Feed extension to help me not cheat and peek at Facebook during the day when I need to be productive. I also make deals with myself about when I am allowed to peek at my phone. Each day the deal is something that I need to accomplish from household chores to an article for a client to finishing a book. Once I fulfill that daily contract with myself, I can cruise the FB newsfeed and catch up on all I am missing out on. Email also has been of my biggest distractors so now I check it once in the morning, once midday, and once before the kids get home from school. I noticed that each time my phone made a ding, I ran to it like my cat when I shake the treat bag at her. It lead to lots of interruptions, a half-present mom, and a lot of anxiety when I wasn’t dealing with whatever I had opened. If I can’t sit down at my desk and deal with it with a proper response, I just don’t open it! Not only has it made my mornings smoother, but it has made my entire life run more smoothly. I am big on maximizing my time and I know that you are too. I have discovered that podcasts and audiobooks make wonderful companions in the morning while I am getting things done around the house. Three of my favorite podcasts right now for making the most of my mornings are the The Lively Show, Magic Lessons, & Elise Gets Crafty. Thanks to the Overcast app that I downloaded, I also am listening to them at a quicker speed which helps me consume a little bit more while I am tackling that laundry and tidying the house. Not only am I proud that I am being productive in my home, but I’m learning so much about living with intention in the process. I may be one of the rare ones in the world because I rarely feel guilty about making time for myself. I know when I can fill my cup up, I have more to give to everyone else. I am not sure if that is because I have such a supportive spouse who has always encouraged that or if I just have always been thinking about myself. Oh, who are we kidding? It’s probably both! My ideal morning involves a good Bible study on She Reads Truth, a cup of HOT coffee, a little journaling (right now I am doing this journal with my husband) and then I head to the gym where I do classes I really love and that make me happy. Our mornings aren’t always perfect, but starting with good intentions, smart planning, and a little self-care reward help me start my day on the right foot! Do you have any tips or tricks for a great morning routine? 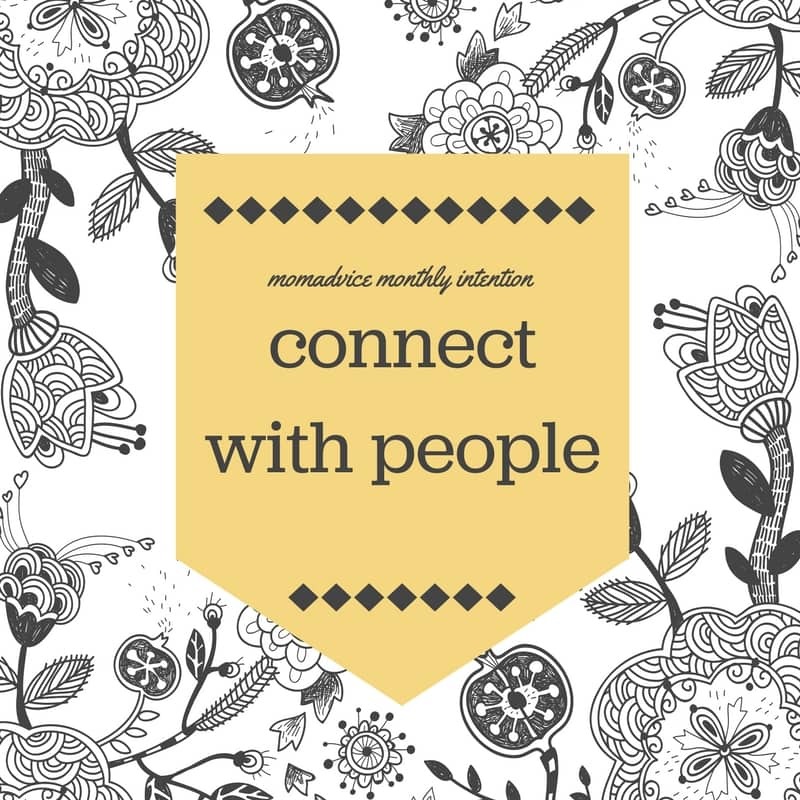 I’d love to hear them as we explore this topic this month in our m challenge series! *this post contains affiliate links. I only recommend what I love! When I say that my life has felt a little disorganized, I mean it! One sore spot in my house has been my spice cabinet and pantry. Thanks to the gentle shove (ahem) of The Magic Art of Tidying Up, I am trying to transform those sad corners and joy-robbers into more thoughtful spaces. 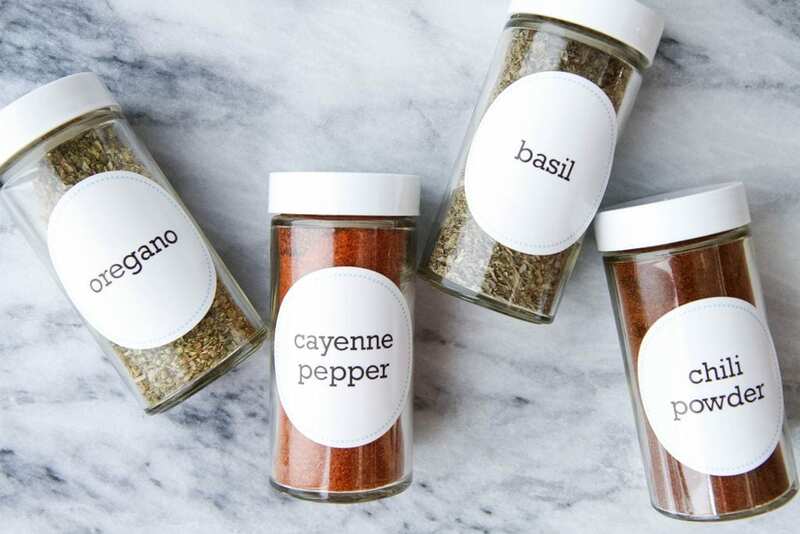 I figured that I can’t be the only one with a disorganized spice rack so I wanted to offer free printable spice labels and pantry labels that you can use to spruce up your own space too, designed by our own MJ from Pars Caeli! Here is my cabinet before I tackled it. There were several spices that had empty jars (why? who helped me on clean-up? WHO? ), several duplicates (who does the grocery shopping? who? oh wait…), and there were some that had labels as far as back as 2008 (THE SHAME!). 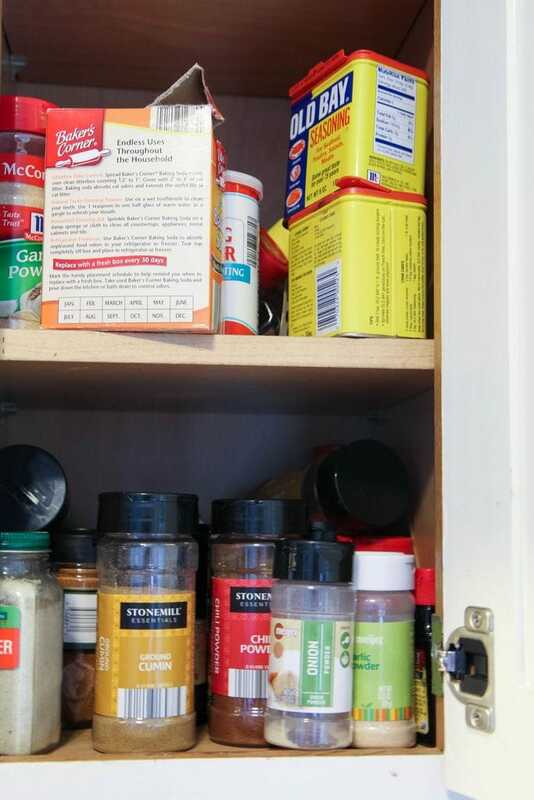 There were also spices lurking in a few other corners in the pantry that were, of course, duplicates. Hunting for spices in a million spots and then trying to not get a black eye from knocking myself out with one as I dig around was a nightly occurrence. I absolutely love the clean design of these labels and they couldn’t be easier to print. You will need to purchase a package of this style of label to print on. We kept the design simple and light to keep the ink waste to a minimum. 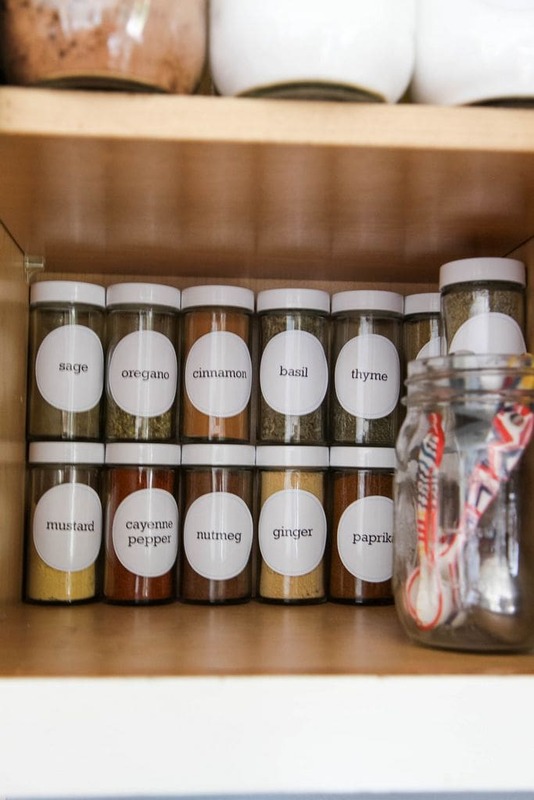 If you have spice jars you can reuse, by all means do it! About five years ago, I asked my in-law’s for two sets of these jars since I intended to redo my spice cabinet. I found them when I organized my scary storage side of my basement this weekend while binging on podcasts. It felt like Christmas all over again. This decluttering has really been paying off! I used a small funnel to funnel the spices that still had life in them into these new fresh jars and then attached the new labels. How easy is that? For pantry items with a larger volume, I used some mason jars that I already owned that had been gathering dust on a shelf. These are the perfect holders for these items and the labels work really well on this size jar too! This corner is making me so much happier and it made prepping for our dinner hour so much easier this week! I didn’t realize how much frustration I was having and how much time I was wasting hunting for these spices each night! 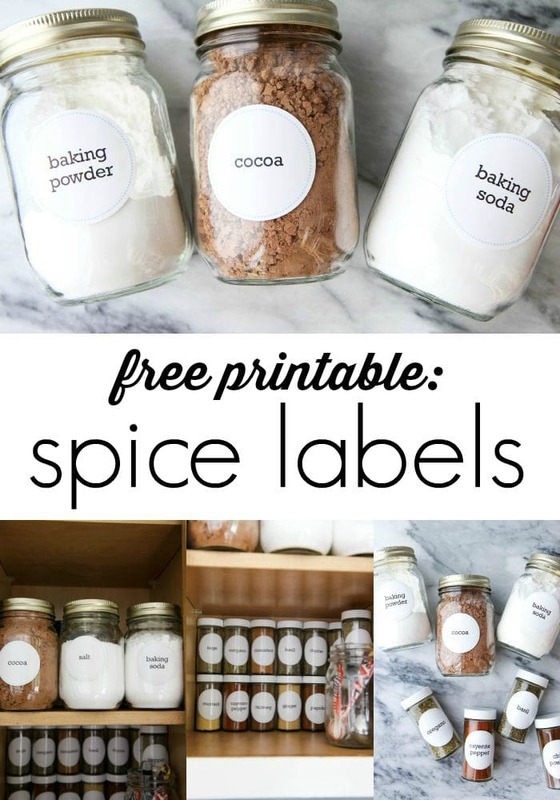 If you are interested in receiving 14 free home management printables and these beautiful pantry labels (see the small sampling above), just input your email below or in the sidebar and we will send you the link to your packet as our thank you for being a subscriber (look for it in the final welcome email). Subscribers will have access to our additional printables as they become available. Note: if you already subscribe to the Mom Advice Newsletter, be sure to look in your inbox for a special email that contains the link for your set of these printables! If you can’t seem to get the form to work with your browser, just look over to your right in the sidebar on the site. You will see a handy form there too that works with all browsers! We appreciate you so much! Thank you! 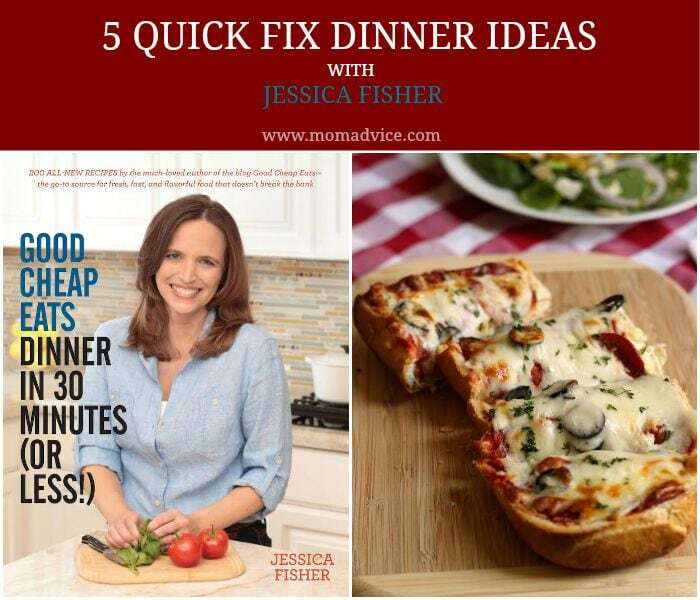 Jessica Fisher is the force behind both Life As Mom and Good Cheap Eats, where she shares budget-friendly, family-centered recipes and ideas. 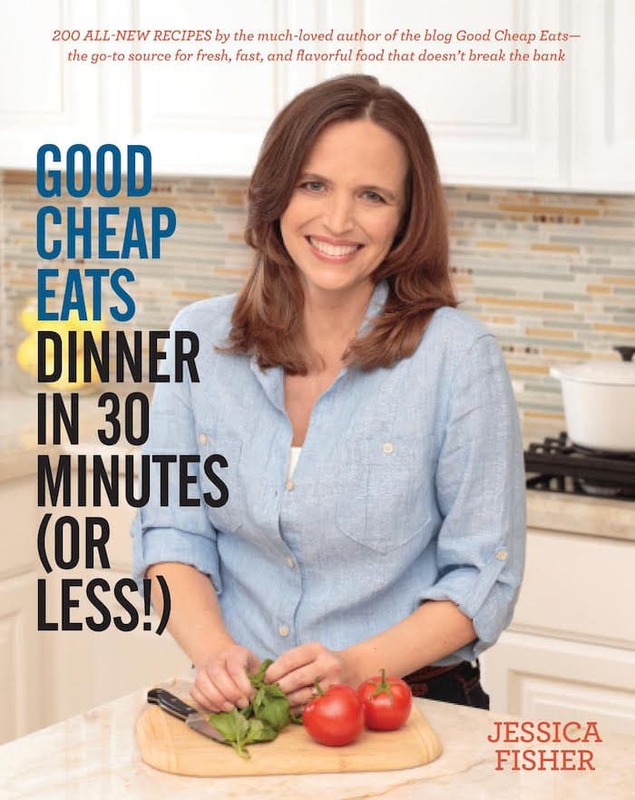 She has been a friend of mine for many years and I so admire all the work she does to create family meals on a budget! I’m so excited to have her contribute to our Meal Planning M Challenge with some great dinner ideas straight from her new cookbook! What to Do When You Don’t Know What’s for Dinner? For most of us, this isn’t entirely true. There’s nothing easy to make to eat, but there’s probably actual food in the house. So, what do you do? Do you give in to the impulse and pay for overpriced burgers and fries? Or do you exert yourself, as Jane Austen would say, and cook something up? Dinner doesn’t have to be complicated — or longer than your favorite TV show. If Agent Coulson and his team can catch the bad guys and acquire major super powers in 60 minutes, you can make dinner in half that time. 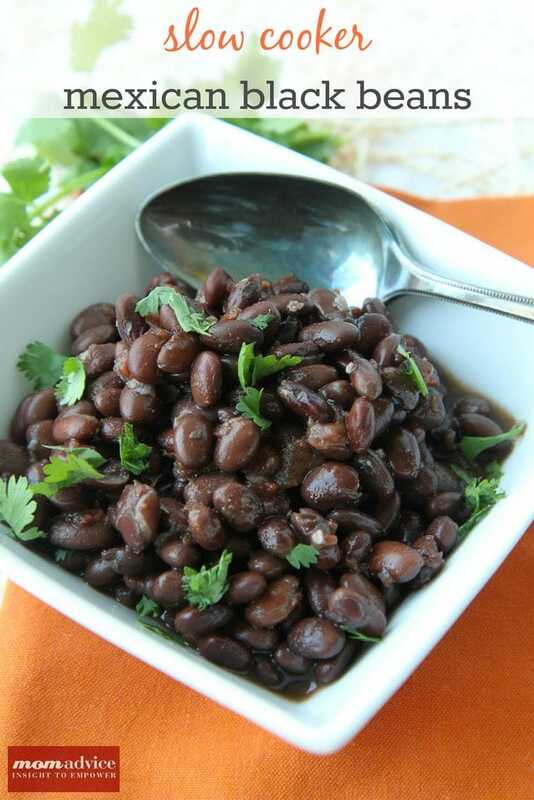 Beans and rice – A rice cooker can produce perfect rice in 20 minutes. Opening a couple cans of beans, shredding cheese, and mixing up some salsa might take you another ten. Between the two of you, you’ve got the makings for a great supper that’s filling as well as economical. This Chicken-Cilantro mixture will be the piece de resistance. Lotsa pasta – Pasta is the go-to choice at my house. My kids can smell boiling noodles from a mile away. They’d be satisfied with butter and parmesan, but in just a few minutes, I can whip up a broccoli cream sauce that they gobble down with gusto. 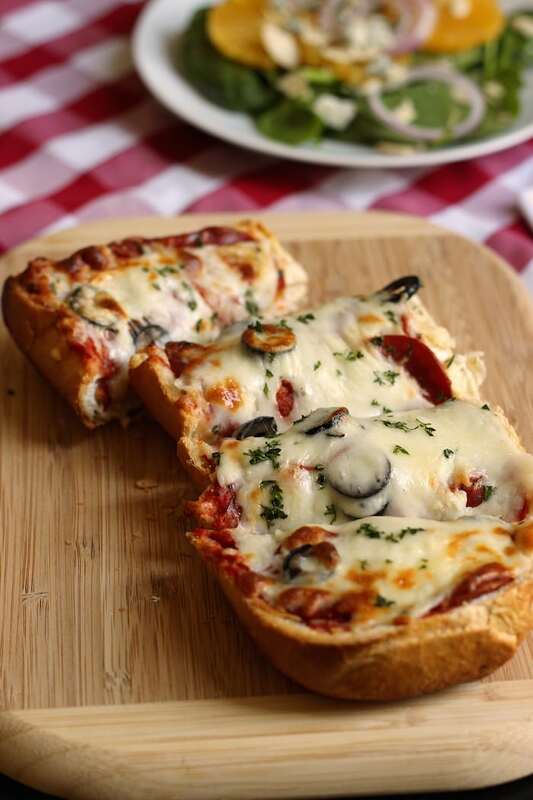 Piece’a pizza – It might take an hour or two to proof traditional pizza dough, but we can have a great pizza dinner without the wait. Using French bread, pita bread, lavash, or tortillas for the base, I can create custom pies in just a few minutes. Wrap it up – Keep tortillas on hand for quick sandwiches and burritos. Frozen chicken tenders cook quickly; just pull as many as you need from the bag. Throw on some shredded cheese and vegetables, and drizzle with your favorite sauces. Or go meatless with something like these Green Chile Burritos. Salad’s on – I’ve got an 11-year old boy who will eat Caesar Salad until the cows come home. If I keep those ingredients on hand, I’ve always got a dinner he loves. 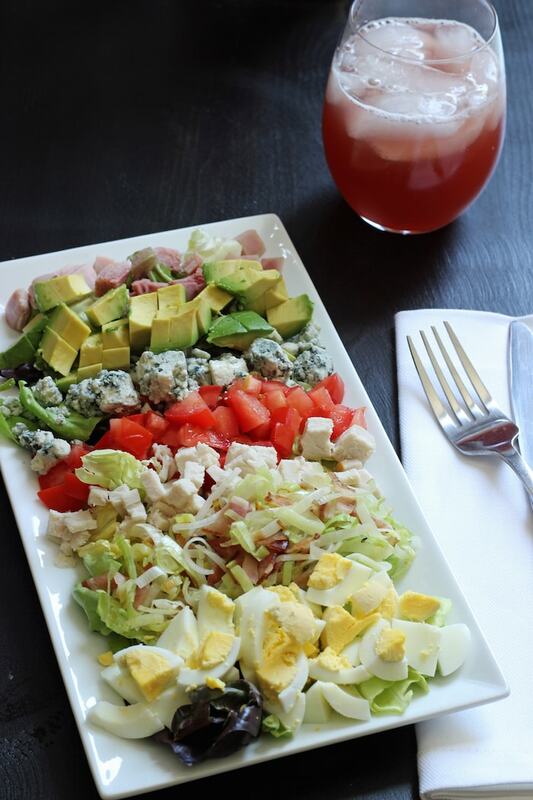 Explore the world of salads and find those that really make your heart happy. Cobb? Tostada? Pasta? Cole slaw? 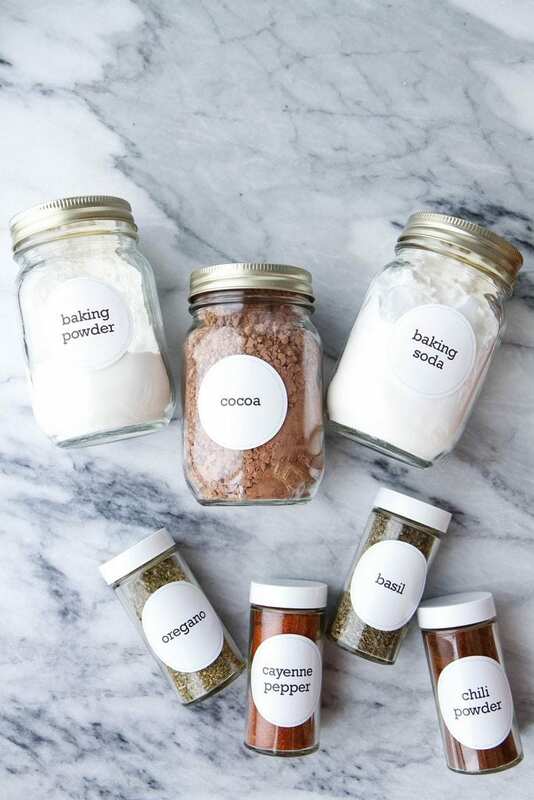 Use those as your go-to’s, stocking those ingredients as pantry staples. Add a cooked meat for the carnivores in your midst. You’ll eat fresh in no time at all. Need more inspiration for a quick fix? I spent a year researching how to make dinner quick, easy, and healthy. My findings are stuffed into Good Cheap Eats Dinner in 30 Minutes (or Less!). 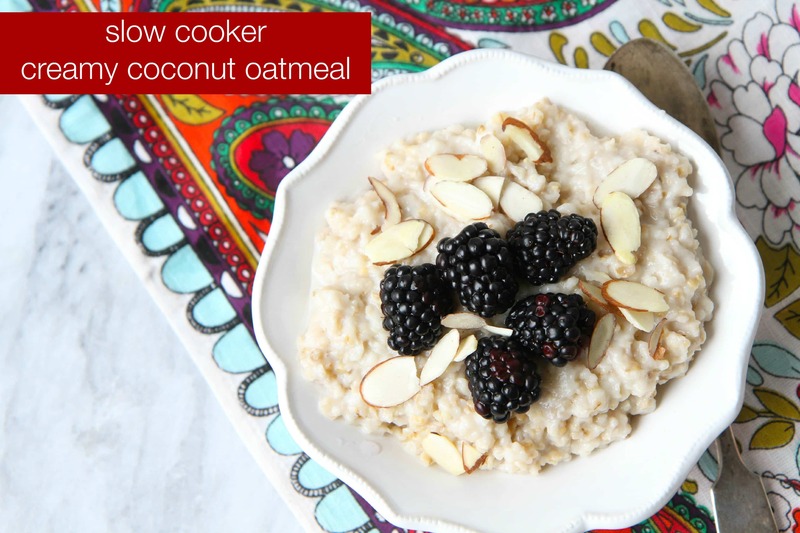 My new cookbook provides over 200 recipes that feature real food, real quick. With over 100 time-saving tips, you’ll eat for a day (or a month), as well as learn how to adapt your own kitchen skills to economizing time and money. Dinner time doesn’t have to be complicated, expensive, or stressful. You’ve got the skills; you just need to know how to use them to your advantage. You can totally do this! What’s YOUR favorite quick fix? 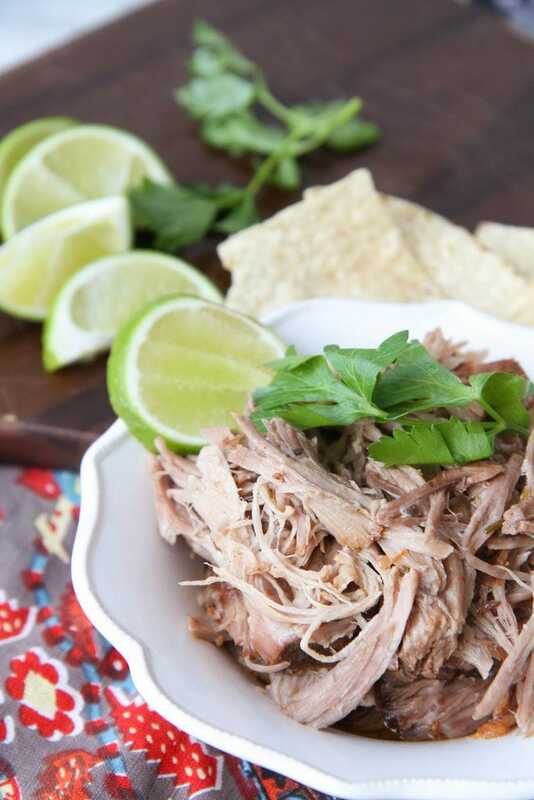 I believe that the slow cooker can be every mother’s best friend. What could be easier than throwing in a few ingredients, plugging it in, and then going about your day, without the worries of needing to figure out what everyone is going to eat for dinner? 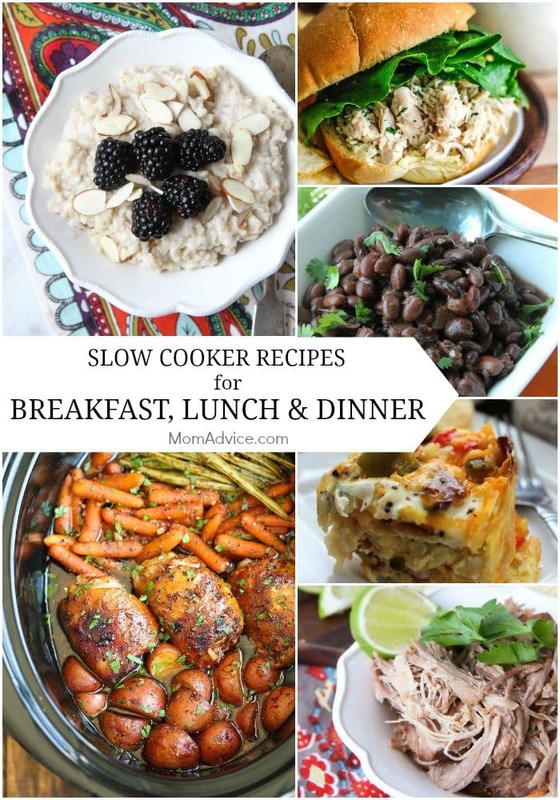 A few years ago I discovered the beauty of slow cooking for breakfast and lunches as well as dinners. Setting a slow cooker to cook overnight and waking up to breakfast is a glorious thing on busy weekday mornings and having meat, soup, or a filling that’s been cooked and ready to go into a sandwich or thermos takes the “what’s for lunch?” out of the busy morning equation. With this in mind, I’ve rounded up some of the best slow cooker recipes to boost your menu ideas and to be a resource for our M Challenge focus on meal planning. Plug these recipes into your menu planner and you will be able to take advantage of the cooker’s “set it & forget it” function and help make your meals go smoother. Some of these are Mom Advice recipes that weren’t featured in our 21 Easy Slow Cooker Meals and the rest are from around the web that I chose to show the variety of foods that can be cooked in your slow cooker. I hope you enjoy them and that they make your meal planning a breeze! Slow Cooker Black Bread @ Kleinworth Co.
For our Meal Planning M Challenge, we don’t want to overlook the challenge of creating school lunches day and and day out for the school year, so we’re republishing one of my favorite Organizing/DIY projects: making a “lunchbox creation station.” I love this organizing idea for two big reasons: it’s easy for the kids to find things for their lunches, putting a lot of the responsibility to them AND it’s easy for me to see what we have available and what I need to stock up on. That’s a win-win! As our kids head back to school, I am in preparation mode to get our family organized & back on track for the new year. 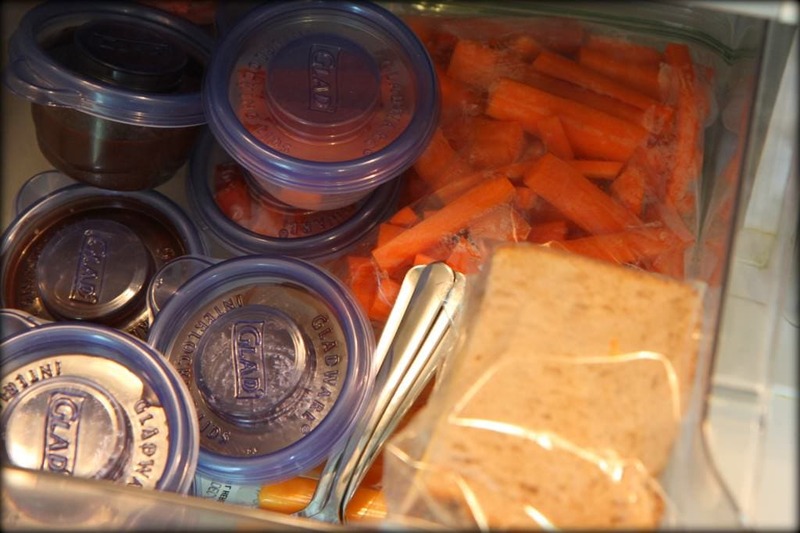 One area that I am always working on organizing is streamlining our lunchbox routines. 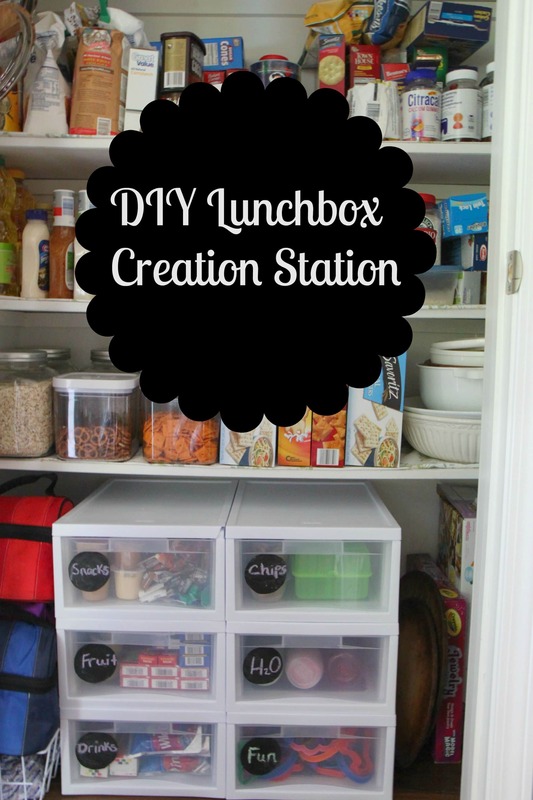 I am excited to share with you my DIY lunchbox creation station that you can create in a corner of your home to streamline your lunch routines. You won’t believe how easy this is to create and you will love my idea for revamping this into something you can use in the summer months too! We are going to start this craft by creating our cute Chalkboard labels first. 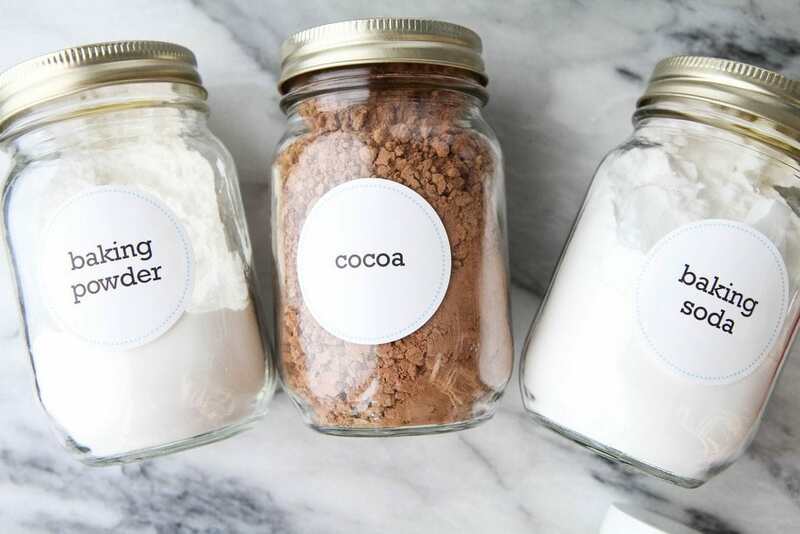 You may recall that we made these easy chalkboard labels before when making my super cute Chalkboard Conversation Bubble Cookie Jars. We are going to do the same thing that we did in that craft for this one, but we are cutting them into circles instead of the conversation bubble! First, pull out your Avery Sheets. 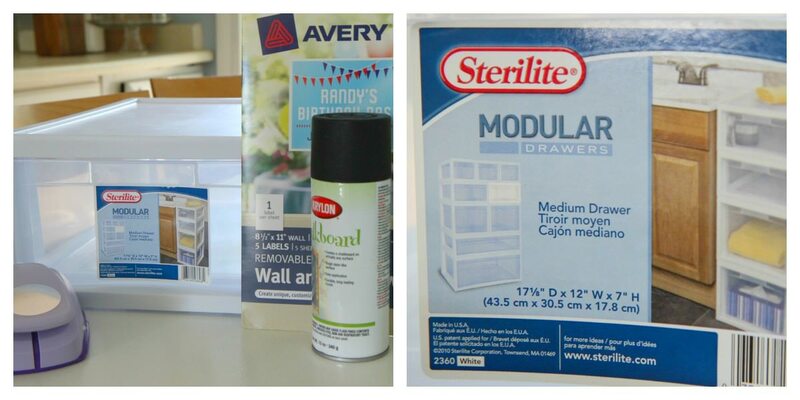 For this craft, we are going to use the Wall Application Side for spraying with chalkboard spray paint. This is the side that has the sticky side that is removable and adjustable… perfect for people who can never get anything on their projects perfectly straight. In a well-ventilated area covered with newspaper or cardboard, place your Avery sheet. Shake the can vigorously for two minutes. Hold can 10-14 inches away from your project and begin spraying. 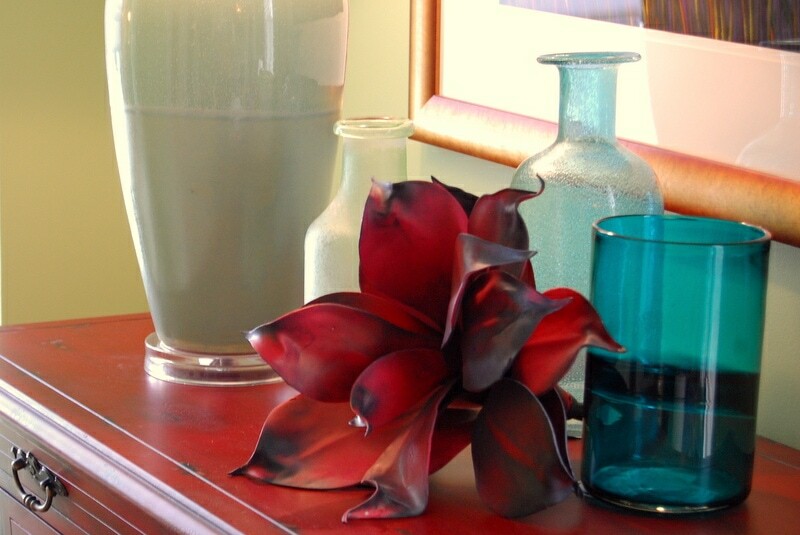 Spray a thin coat in a sweeping motion beginning off the surface and continuing off the other side. Follow this pattern horizontally and then vertically. Wait fifteen minutes or so and then apply another coat. They should be dry and ready to cut in about an hour. 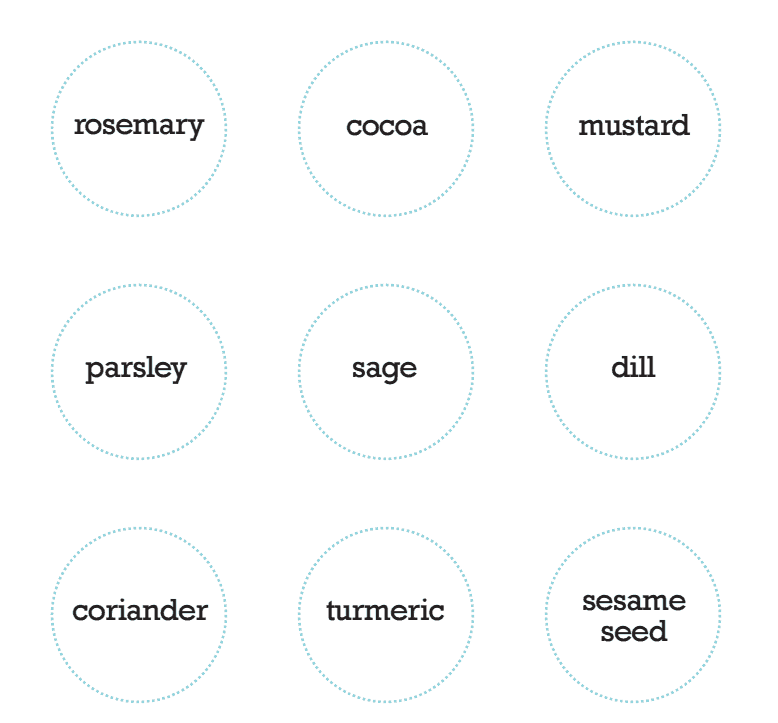 Cut these out into circles. One sheet should give you six generous size labels that you can write your labels on. While those are drying, you can begin assembling your drawers. Your needs for your lunchboxes may be different than my own. I wanted to show you what I did in my drawers, though, to inspire your own categories for your lunchbox creation station. I used six drawers because that is what would fit on my pantry floor and would cover all of our lunchbox needs. I have a drawer for snacks, fruit, drinks, chips, water, and a drawer of fun (more about that below). Think of the problem areas in your kitchen and create a drawer to accommodate! Snacks- Granola bars, low-fat puddings, natural fruit leathers, nuts, goldfish crackers, rice cakes, wheat crackers, sunflower seeds, homemade cereal mix, fruit snacks. Fruit- Natural applesauce, yogurt covered raisins, raisins, dried fruit, apples, bananas, oranges. Drinks- Juice Boxes and organic milk boxes. Chips- Sweet Potato Chips, Veggie Chips, Pita Chips, Pretzels (I package my chips in tiny Glad containers and have used these a few years now with great success. This drawer also contains my new favorite sandwich cubes that I found at the The Container Store). H20- This is where I have all of our water bottles so that the kids can grab one in the morning and before extracurricular activities. Fun- This is where I keep my cookie cutters, homemade play dough, and craft supplies for our kitchen. Next to the drawers, I nestled a basket for extra snacks to be placed in the drawers as needed and the lunchboxes. 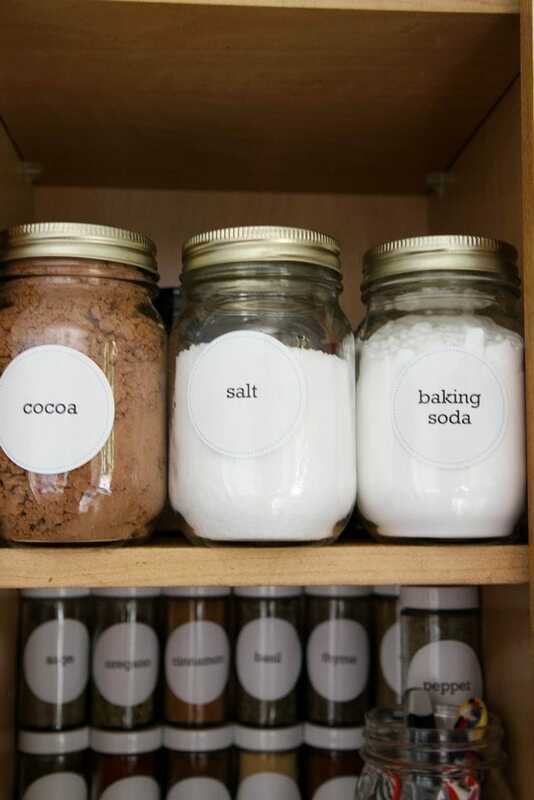 Place your designated labels on your drawers and stand back and behold your AWESOMENESS. 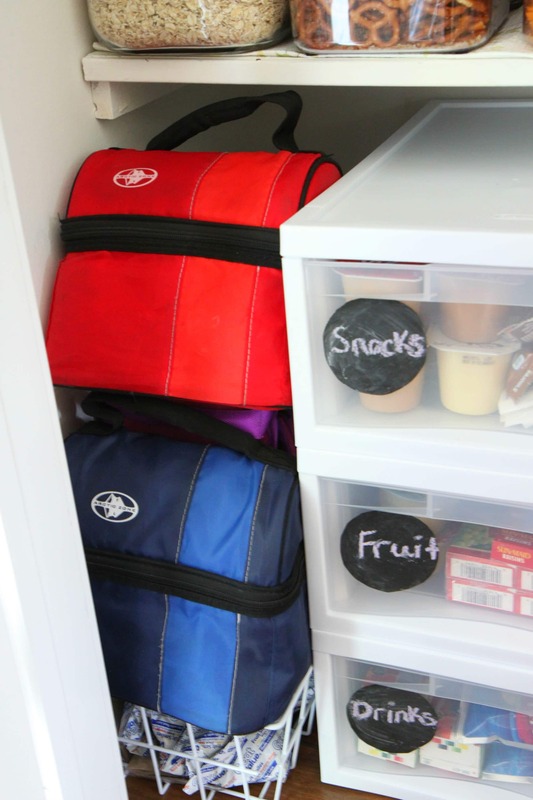 With this simple system in place, the kids are now in charge of creating their own favorite lunch combination, selecting one item from each of the lunchbox drawers. My kids have already been scheming and dreaming about their daily lunches and are excited to finally be in charge of their own lunch destiny. When the summer months roll around, I plan to erase the labels and fill them with all of our summer necessities like pool snacks, water bottles, drinks, sunblock and insect repellent, and other items that tend to accumulate on counters and on top of my fridge. 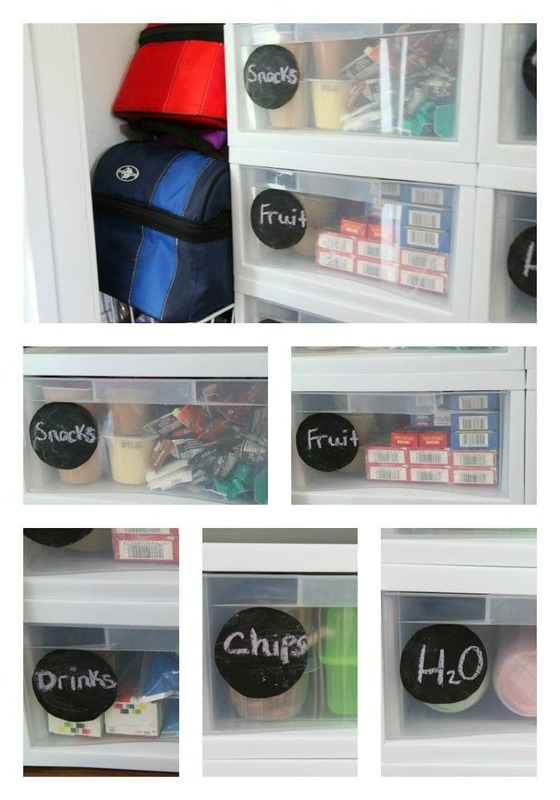 I think this is a great organizing solution for all year round! Designate one day a week (my day is on Sunday) to creating your snack packs and making items that can be tucked into lunchboxes. 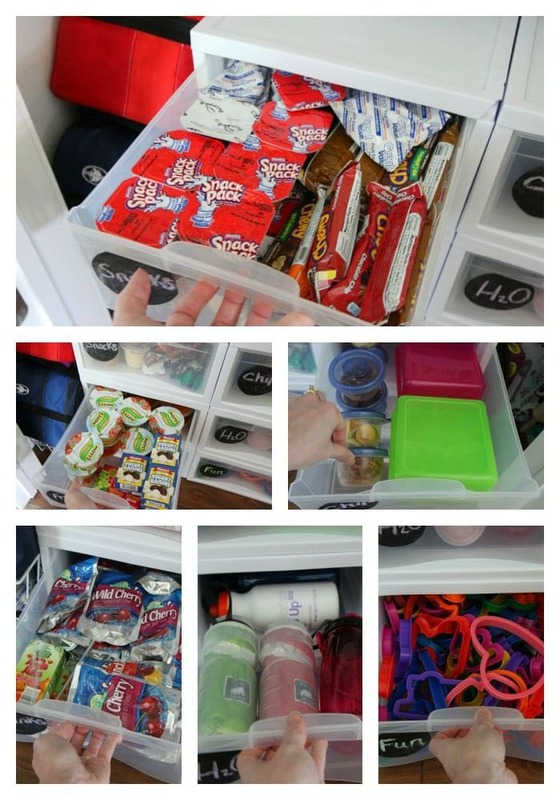 Another tip to keep your lunches organized and accessible is to designate one refrigerator drawer towards lunches. Items like freshly cut fruits and veggies, sandwiches, and Asian lunchbox noodles can all be waiting for the morning in this drawer. I even tuck commonly forgotten items in the drawer like napkins and spoons to trigger my tired brain to kick in on busy school mornings. Don’t forget about yourself in all of the hustle bustle of school preparation! I love this DIY Salad Bar to help keep me on track with healthy eating during the school year! What do items do you love to keep on hand for your child’s lunchbox? I would love to hear your ideas! I am a part of the Walmart Moms program, and Walmart has provided me with compensation for these posts. My participation is voluntary and opinions are always my own.